Hanover Engineering was retained by Pineville Properties as their site engineer for the design and development of a 74 acre retail shopping center located on the southwest corner of Airport Road (SR1003) and PA Route 22 in Hanover Township, Lehigh County. The center contains over 507,000 square feet of retail space, including two large retail stores, multiple restaurants, and various smaller retail stores. 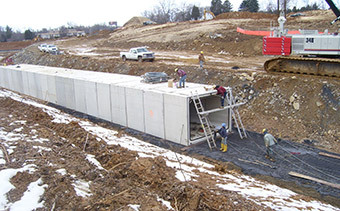 Site utilities, including water, sewer, stormwater management facilities, and 1,800 linear feet of an 8’ x 12’ box culvert to convey stormwater, were designed and constructed to serve the development. Hanover Engineering provided Pineville Properties with onsite engineering services for all aspects of the project, including completing a Phase I Environmental Study, obtaining zoning variances and the required conditional use approval, completing the ALTA boundary and topographical surveys, preparation of the land development plans, design of the stormwater facilities and site utilities, and acquiring all local and State approvals and permits. Offsite design and permitting services were also provided for the improvements completed on Airport Road in conjunction with the shopping center. These roadway improvements, totaling over $5,000,000, included full reconstruction of the road to provide additional turning lanes, upgrades to the pedestrian facilities, and substantial improvements to the traffic signalization and coordination along the State corridor. Hanover Engineering also provided services during the construction phase of the project, including road, utility and building stakeout, as-built surveys, and contract management and observation.